Earlier, I wrote about art representing events in history. William Simpson from my first post was renowned as a war artist. He is remembered for his portrayal of ‘The Charge of the Light Brigade’. It must have been exciting, exhilarating, and dangerous for these war artists to do their work. Paul Mansard traced the progress of the WW1 in Belgium and France. His beautiful and at times disturbing pictures document the loss and devastation caused by the war. They were a response to events and had widespread appeal. 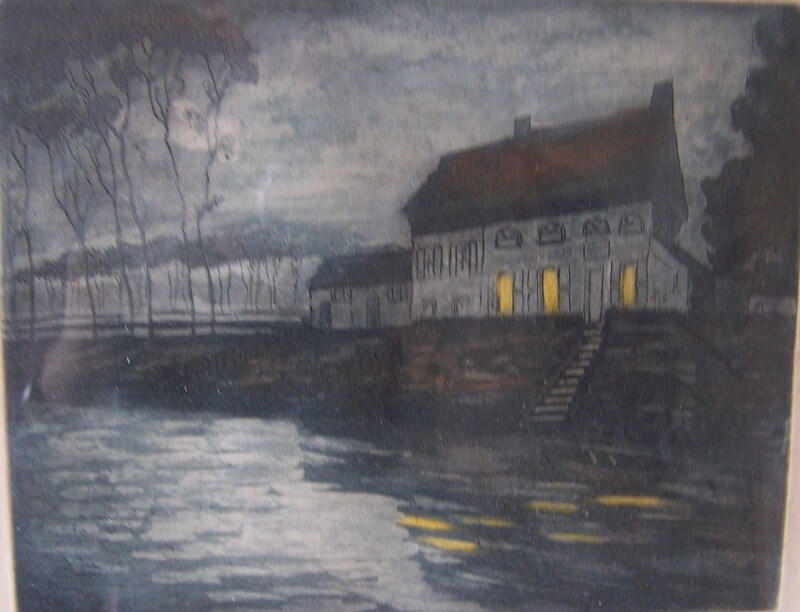 The ‘Ferryman’s house’ shown in this etching was a strategic battle site in December of 1914. Although this etching shows little damage, in truth the house was bounded by trenches on both sides containing some 200 men and the Germans maintained machine guns in the house itself. The ‘Ferryman’s house’ fell to allied troops after six attempts. The attack was planned for the evening of Friday, December 4th, 1914. The 11th battalion of the 1st Zouaves, reinforced by the 4th Company of the 94th Territorial, and backed by a company of Bat-d’Af. The dark night was shaken by storm, thunder, lightning, raging winds, snow so wild that the attack was postponed. On the following night the rain covered the initial advance to the wire and the main attack followed quickly and unexpectedly. The fighting was fierce and claustrophobic in the trenches. They fell to the Allies but the worst was yet to be faced. The dread machine guns in the house spewed forth their death as the troops pressed forward. The darkness hid the devastation and the advantage, thankfully. For two hours, darkness streaked by lightning, the attack on the house continued until it fell to the Allies. The ‘Ferryman’s’ house was razed to the ground. But only in the dawn’s light was the cost of this battle truly seen. This entry was posted in Etching and tagged house, river, trees. Bookmark the permalink. Your comments on the socioi-historical background to Mansard’s aquatints are so true, each of his pictures can only be understood in terms of significant wartime events. Are the colours accurate? Have previously seen only dark blue nighttime versions of this print. Yes. The colours are true, whether they are original or not I cannot tell you. My engraving is titled and signed in pencil by the artist. That’s interesting and I am sure they are true even if affected by browning of the paper , it suggests that Mansard tried out various inks for printing, i had previously seen only a bluey-green. The reflected lights on the water are also slightly different. Being hand printed probably by the artist himself rather than a commercial workshop allowed him to try out different versions. Thank you for that information. I had not come across that in my reading. I have two mansards one which is the exact image of what you’re showing above which is titled Maison du Passeur ? Signed Paul Mansard.